Juha Jokela (b. 1970) is a modern writer in the best sense of the word. His witty and surprising humour, compelling narratives and nuanced characterizations are tightly bound to the present moment. Whether focusing his sharp vision on the world of business or the spirit, he writes with deep understanding of the personalities involved. Jokela began his career in television as a screen writer. 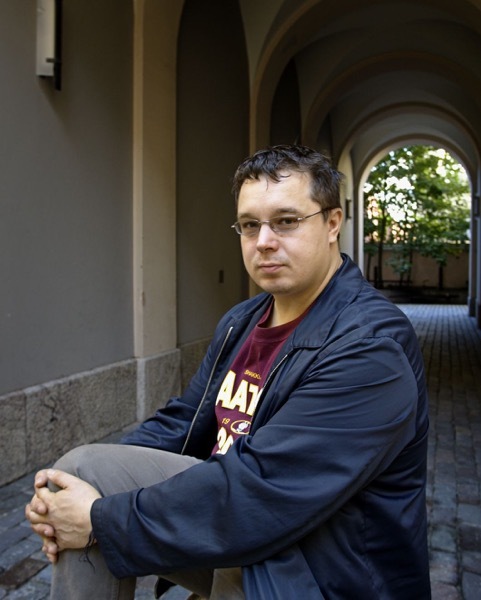 His first play, Mobile Horror (A Mobile Horror, 2003), garnered unprecedented critical acclaim, and can truly be said to be one of the most successful plays in recent Finnish theatrical history. This comedy, set in a mobile phone company, was quickly produced by a number of theatre companies. Jokela’s Nordic Drama Award-winning play, Fundamentalisti (The Fundamentalist,2006), is a more serious two-person play examining religious fanaticism; it, too, has achieved both popular and critical success. Jokela’s highly-anticipated play Esitystalous (Performance Economy, 2010) premiered at the Espoo City Theatre into huge success. This satire deals with performance as a basic element of society, politics and business. The first season was sold out already in advance sales. Critics have praised the play for its phenomenal and witty dialog, humor and criticism against the contemporary society where narcissism has become the main fuel of all kind of action. Patriarkka (The Patriarch, 2012), the most tender and poetic of Jokela’s plays, written for the Finnish National Theatre, was also a huge hit success among critics and audiences. The play won the Audience Award at the 2014 Heidelberger Stückemarkt. In 2013 Jokela continued the themes of Performance Economy in Esitystalous 2 – Tehtävä Espoossa (Performance Economy 2 – Mission: Espoo) which delved into the themes of local identity and the relationship between art and public power. Jokela’s comedy Sumu (Fog, 2016) is a sharp study of ethics, business and politics in the shadow of Russia. In 2013 Jokela received the Finnish Ministry of Culture’s Finland Prize. In early 2014, Somnimag, a small technology company, has developed a revolutionary brain scan machine, but needs marketing capital to sell it. When the company receives government funding to export the product to its eastern neighbour, the company directors are faced with a moral dilemma: is doing business with Putin’s Russia a viable option? Olli, the CEO, is between a rock and a hard place, as Jone, the Marketing Director, is willing to put morals aside for the project, whereas Taisto, the Head of Research, is against any kind of cooperation with Russia. As Russia’s domestic and foreign policies become more and more difficult to predict and the new hire, Russian-Finnish Larissa appears to be so qualified as to be suspicious, there is no return from the grey area. Juha Jokela brings his famously intelligent and humorous touch to the eternal theme of a small country’s balancing act in the shadow of a large and unpredictable neighbour.